GE Stone, a subsidiary of IGE Foreign Trade, specializes in the exportation, importation and distribution of travertine, marble, and limestone products to countries around the world. IGE Stone is recognized world-wide for it's highest quality products, and stands out from other companies for it's exceptional customer service. IGE Stone offers a complete selection of exclusive Turkish natural stones, including travertine, marble, limestone, antiqued stone, mouldings, medallions and more. IGE's highest quality stone products are available in tiles, slabs, cut to size, or customized. Beautiful handcrafted mosaics, borders, columns, fireplaces, sinks, and garden ornaments are also available. 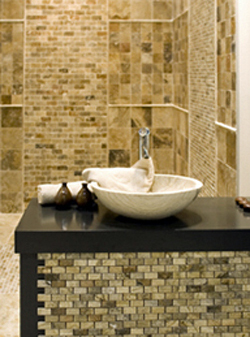 There is a vast array of colors and shades to choose from in the travertines, marbles, and limestones. The stones can be finished in any manner requested including brushed, tumbled, chiseled edge, bush hammered, split-faced, honed, polished, filled or unfilled (travertines only), and more. IGE Stone's customer service is exceptional. IGE Stone provides you with quarry to project customer service. Our buying offices in Istanbul, Turkey find the highest quality stone, which is processed under strict quality standards, and to our customer's specifications. A personal inspection of the stone product prior to its departure, by our experienced staff, guarantees reliable, highest quality product for each order. Our staff is always available for your questions and feedback. Follow up with you after the delivery of our product is standard procedure, as your feedback is highly valued. Your satisfaction with IGE Stone's products is of the utmost importance.